Scores of Nigerians are seeking solace in gambling as a way of enduring the harsh economic climate that has overtaken the country. Punch's Gbenga Adeniji writes on this trend. The time was barely 6: 30am. The location was Ikeja and several kiosks belonging to agents of gaming outfits were already open for business. Their customers were also on hand to stake for the day with the hope of recording good winnings. Machines were being punched to record number entries just as those who placed bets in a game the previous day were busy checking the results from a white chart fixed to a wooden board. The agents, comprising men and women and the elderly, allowed no disturbances whatsoever as they dutifully attended to the army of people who besieged them to place a bet. It was indeed a rush hour. One of the bettors, who simply identified himself as Sheriff, told our correspondent that such situation was the case every morning. He added that gaming is a serious business hence those running it also give it the seriousness it requires. Sheriff added that he decided to continue putting a bet because he saw it was the only source of money making for him. According to him, the desire to dedicate time to gambling became intense when he won over N70,000. Another gambler, Innocent Bright, said he developed interest in gaming last year when he played a particular game with N10 and won N2,400. He further said the winning was his third attempt at gaming, and noted that the experience assured him that more goodies awaited him if he persisted. For Ms Amarachi, who told Punch that unemployment pushed her into betting, the activity should be seen as a valuable contributor to economic growth because of its youth empowerment aspect. She also said she would not desist from gaming even if she eventually secured a more financially rewarding job. She said, "There is nothing comparable to free money because that is what gambling is all about. But in the real sense of it, I think the money we make at the end of good forecasts is not really free. As they say, ‘Nothing ventured, nothing gained.’ We put in something only that what we intend to get at the end of the day is often more than the money staked." Twenty-eight-year-old Ayomide Folorunsho is one gambler who is motivated by what he described as his love for sports. He explained that he enjoys sports betting because it allows him to utilise his interest in football. He also said he puts a bet for eight games daily. “I like football and that fired my interest in sports betting. When I first started, I had to hide the coupon from my parents because I did not want them to know I gamble. They could read wrong meanings into my action. I only told them of it when I won N12,000. They were not impressed but told me to be careful. Betting is not seen in a good light in our country because it is believed that unserious people indulge in it. I don’t go to game shops to check results. I only check football sites online to know if I win or lose after every match,” he said. 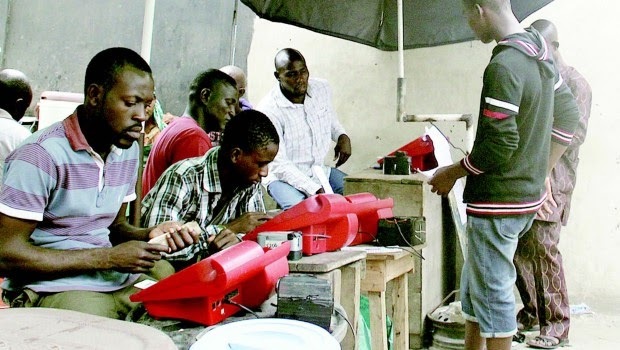 An agent in one of the betting shops in Ojuelegba, Surulere, Lagos, Mrs. Vivian Anthony, said each agent of a particular Lagos-based betting firm receives 15 per cent of total sales daily. She stated that the total amount an agent makes depends on the number of persons who patronise such an agent. When asked the biggest win she had recorded since she became a betting agent five years ago, Anthony only said it would be difficult to say. She said, "I have heard of people winning millions. It is not a rumour. People make good winnings every day. I cannot say if anyone has won a million naira after placing a bet in my shop because it is not important for such a person to come back to me. Many people come to place a bet in my shop like they do in the shops of other principal agents. They will go to the headquarters of the company to claim their winnings since we are not the one paying. I can only know if anyone has won a big money if such a person comes back to me to assist in collecting the money won." Another agent who only gave his name as Yemi described gaming as a game of luck. He noted that those who gamble continue to increase daily because they hear stories of people who won. Yemi said gaming for lotto takes place at 9am, 12pm, 3pm, twice between 6pm and 6:45pm, and 10pm daily. Punch learnt that some of bettors prefer to gamble even when they are yet to eat or don’t have enough money to spend. This is the situation with one of the gamblers in Agege, Lagos, who gave his name as Fisayo. He said there is an unexplainable addiction behind gaming which makes him and others involved in it unable to stay away even for a day. Like others who spoke, Fisayo refused to have his photographs taken. Commenting on the trend, a lecturer in the Department of Psychology, Obafemi Awolowo University, Prof. Oluwatoba Elegbeleye, said gambling emerged through civilisation. Explaining that betting is a social part of gambling, the don stated that yahoo yahoo (Internet fraud), kidnapping and robbery also constitute gambling. “As the economy worsens, people look for avenues to make money and one of such avenues is to take to betting. They will refuse to face reality." The university teacher added that because those who gamble live on permutations on a daily basis, they tend to hang on hope that they are going to win someday even when they are losing. He also said the implication of gambling was that when an individual continuously leaves certainty for uncertainty, such a person becomes psychologically deficient. But one of the leading patrons of gaming centres in Nigeria, Chief Kessington Adebutu, described gaming as the stock exchange of the ordinary man on the street. In an interview with Punch, Adebutu also likened the plight of bettors who lost huge money to gaming to that of those who lost huge money when the stock market crashed. Noting that the activity has helped the country a lot, he added that it continues to calm individuals who have the tendency to misbehave because they had no job. He said, "Gaming has helped this country a great deal. So many people who ordinarily would go on the rampage on the streets have their tempers tamed because of gaming. They have hope that something better would come their way."